To kick off reveals from Rogue Deity Descent in Weekly News Bits, we get a grand total of 4 new Kagero Blaze-related cards. This month’s Monthly Bushiroad comes with a means to get the cover as a smartphone wallpaper if you fill out a survey. A brief glimpse at Monthly Bushiroad’s spreads on “Rogue Deity Descent” and “Evil Eye Sovereign”. A quick glimpse at Cardfight!! Vanguard Shooting Star and its heroine. Due to winning at the “Decide Future Goods!! Stage”, these artworks by Kondo, Yui (Hashima, Rin’s voice actress) (An artwork of Rin drinking something) and Team Jaime Flowers (In Halloween Outfits) done by Sasaki, Mikoi (Okazaki, Kumi’s voice actress) will be turned into official goods later down the line. Goods to be sold as Bushiroad’s upcoming Mini Vanguard Festival events. Reference art for “Flame Trooper, Dumjid” and his human host, “Fuchidaka, Saori”. 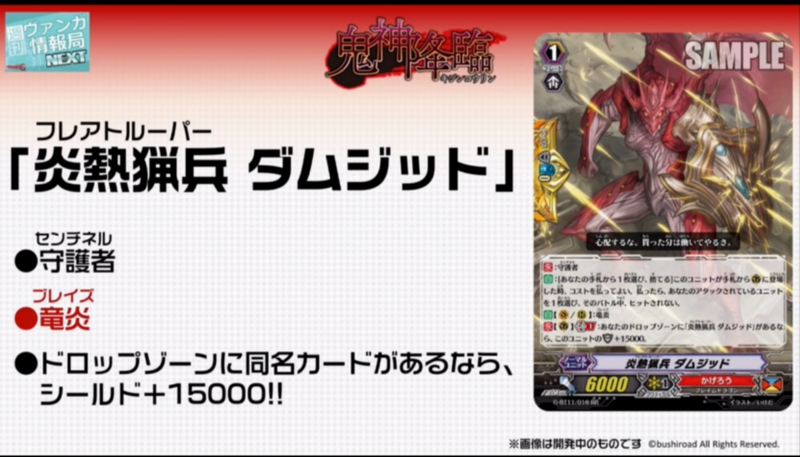 AUTO (RC): Generation Break 1: [Place this Unit on the Bottom of your Deck] When your Unit with the Blaze ability hits a Vanguard, if your Vanguard is Blazing, you can pay the cost. If you pay it, Counter Charge 1, choose of your opponent’s Rear-guards, Retire it. AUTO (RC) Generation Break 2: [Counter Blast 1] When this Unit attacks a Vanguard, if you have a Blazing “Blademaster” Vanguard, you can pay the cost. If you pay it, draw 1 card, and for each of your opponent’s (RC) without a Unit occupying it, during that battle, this Unit gains Power+2000. AUTO: [Choose 1 card from your hand, Discard it] When this Unit is placed on (GC) from your hand, you can pay the cost. If you pay it, choose 1 of your Untis being attacked, during that battle, it cannot be hit. AUTO (VC): [Counter Blast 1] When your G Unit [Stride]s, you can pay the cost. If you pay it, choose 1 of your opponent’s Rear-guards, Retire it, then choose 1 of your Units with the Blaze ability, during that turn, it gains Power+3000. AUTO (VC) Generation Break 2: When each turn ends, if your opponent has no Rear-guards, choose up to 1 Grade 3 Unit with the Blaze ability from your Drop Zone, return it to your hand. The specifics about Nubatama’s new ability will be revealed next week on May 15th, 2017.